Hello Allison and the NosillaCastaways, Allister here from New Zealand again with a review of an application I’ve known about for years but only just grokked. Let me start by reading you a list. To Do (two words), myTo-Dos, iProcrastinate, OmniFocus for iPhone, ToDo (one word), Remember The Milk, To Do Exchange Tasks, Any.do, Things, Due, and Todoist. That’s the list of task management, or “to-do” apps I had tried on my iPhone up until recently. Some of those apps are, or were, quite good. But I don’t use any of them any more. Many had interesting or useful features, some were delightful to use and some were effective task managers. The trouble with all of them was the same – me. I’m not so great at task management and I found in most cases I was not drawn to using them, even though I needed them. In recent months I have been listening to some new podcasts and I have heard some very busy people swear by one particular task management app. They each said the only way that they could get as much done as they do, was because of this app. Then some of them started talking about why this app helps them so much. It sounded both simple and powerful. I also know several other podcasters who have long talked about this same app with reverence. So I began to look at it closely. The app is OmniFocus 2, from the Omni Group. It’s not cheap. But it is cheaper than it was. More on that later. The first thing I did was assume Don McAllister had done a screencast on it. Of course he had – several, in fact. I watched those and saw the ease with which Don was creating new actions, the power with which he could process them and the simplicity with which he could see what needed doing. And it all looked beautiful. That last bit is important to me. If I’m going to buy in to an app that I expect to use daily, I want to enjoy the experience and ugly isn’t going to cut it. This is one of the reasons why I use iPhones and Macs. Back to the price. I had looked at OmniFocus previously and balked at the cost of buying separate versions for iPhone, iPad and Mac. 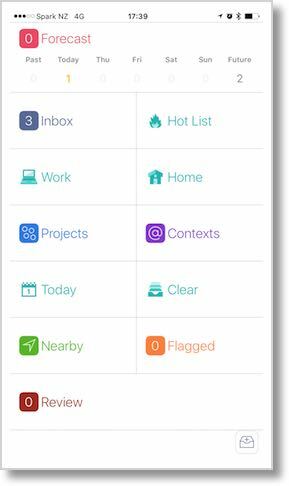 I was delighted to discover that iOS now has a universal app, called OmniFocus 2 (without a suffix of “for iPhone” or “for iPad”). It will set you back $40 in the US app store. In addition to being universal, it also has an Apple Watch app. I watched Don’s screencasts again and did some reading on a few web sites. I forget where. And then I bought the iOS app. Now, what I bought was the standard app. Available as an in-app purchase, there is a Pro version which costs another $20. The Pro upgrade adds a customisable layout of the main screen and custom perspectives. Perspectives are like views and filters on what you see at any one time. They are a pivotal part of the OmniFocus story. Did I need the Pro upgrade, I wondered? Probably not. Then I read that owners of OmniFocus 1 for iPhone or iPad get the Pro upgrade for free. The observant among you will remember that it was in my list at the beginning of this review. So I redeemed my free upgrade. I started playing around with the app on my iPhone, set up the free OmniSync service to sync with my iPad and was about to go and watch Don’s video for a third time when I remembered another podcaster who has produced some material on OmniFocus. 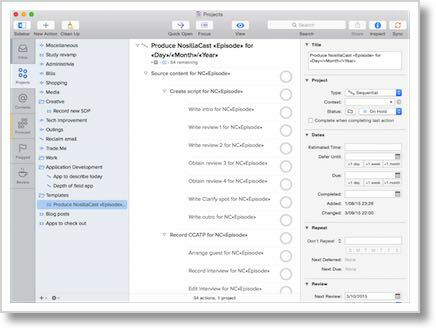 David Sparks, of Mac Power Users fame, has created the OmniFocus Video Field Guide. I watched the fourteen and a half minute preview and was hooked. For the princely sum of $10 I purchased the full guide which weighs in at an astonishing 2 hours, 27 minutes and 14 seconds. Don has two half hour videos on OmniFocus 2 for Mac and a further 17 minutes on OmniFocus 2 for iPhone (at the time a separate app than the iPad one) and these are all you need to understand how the app works and get a feel for how it could be used. David, however, goes a bit deeper showing you not only how the app works but also explaining how he uses the app himself and why. This is a man who is a self employed lawyer, does a weekly podcast, writes books, makes videos, and has a family. He’s a busy man with a lot of things to do! In the video he shows you how he manages the life cycle of his projects and actions, gives some tips for contexts and some best practices, plus shows you some custom perspectives he created and explains when and how he uses them. He also includes some extra tips on extending functionality and integrating with other tools. After watching David’s video through once and then rewatching a few parts (it’s got handy chapter marks throughout) I set up many of the same perspectives as a start point to better manage my actions. I’ve also tweaked my projects and contexts after watching as I now understand better how they work together, and I’m gradually honing my setup as I use it. A short while later I decided it was worth getting the Mac app as well, and I upgraded that to Pro, too because the custom perspectives I had built on iOS are just too useful. There are some things you can do more easily on the Mac with a keyboard and mouse and it’s more efficient for major setup work. The Pro Mac version has AppleScript support and after finding one (mentioned by David) that could copy a template project, I spent a wee while putting together a first draft of a 54 step project to produce a guest hosted NosillaCast episode! That would have been hard work on iOS but the Mac app made it very straightforward. Now – this may seem like an unusual review in that I’ve really not covered how the application works. The reason for that is because I don’t think I can explain it at all well in a three to five minute review. It took me a while to soak in what others were saying, take a look for myself, read some others’ written reviews, watch Don’s videos and decide whether I needed the power of OmniFocus before I decided it was worth buying in. So what I’m doing here is adding to the chorus and saying “check it out.” If you’re already a ScreenCastsOnline subscriber, check out Don’s videos at no extra cost. Have a look at David Sparks’ free sample video from his Video Field Guide. Google (or Bing) up some reviews. Take a look around the Omni Group web site where there is a wealth of information not just on the product but how people are using it and extending it. You’ll need to decide whether OmniFocus is for you, but if you have any doubts about just how good an app it is, let me dispel that for you. It is powerful, simple to use, beautiful, and, I believe, worth the investment. It also has top notch support. There are links below that’ll help you get started with checking out OmniFocus 2, from the Omni Group. Well, that wraps up this not-quite-a-review. For more from me in the Apple & tech sphere, check out macthoughts.net and follow me on Twitter at twitter.com/zkarj. For everything else I do online, go over to zkarj.me where you’ll find The Sitting Duck Podcast (it’s all about the music), my photography and more. What Goes Into Making a Good Screencast?